I inherited my grandma's love of kitchen gadgets. Santa brought me this space-saving wafflemaker and a beat-up (but powerful) blender. 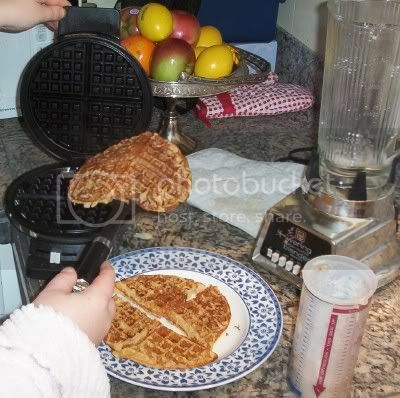 Now I can finally make Sue Gregg's whole grain blender batter waffles--and they are every bit as good as I had hoped! What kind of blender is that? I like the glass pitcher. It's an old Waring blender--probably from the 60's--and I am SO thrilled to have it! After seeing the expensive Vitamix blender, I didn't want to spend even $15 on a low-wattage unit. Most of the better department-store blenders have a wattage of around 650. When I saw this one in a thrift store, I remembered that in every lab I ever worked in, we used Waring brand blenders. To my surprise this $3 blender is powered by 720 watts! I hint, hinted to my husband and found it under the Christmas tree later. so Waring is a good used brand to pick up if you are in need of a blender. My parents used their Waring blender forever and ever, until my dad broke the glass pitcher. The motor, after 35 years, though is still perfectly strong. What did you put in your waffles for the 1/2 cup brown rice, buckwheat, corn or other grain part? Any suggestions on the recipe? Thanks! Meredith, I've been using this recipe for about year, after reading your archives. I love it! You would never guess how healthy they are.